Antique Wedding Rings Twist & Shout! We don't need Tolkien to tell us today, how powerful rings can be. Antique Wedding Rings and Antique Engagement Rings, are charged with deep personal meaning. They convey a thrilling significance for people who wish to express their hope for the future, with a traditional wedding ring from the past. Worn with life's cares, love yet was love. A large part of the Antique Jewels Value, lies in the unique journey its travelled over time and space. Antique Jewelry dealers with their fingers "on the pulse" understand that carefully chosen Antique Jewelry is a good investment. The popularity and the value of Antique Jewelry is climbing as women's jewelry starts to question the brand new jewelry manufacturers they once patronized. Antique Wedding and Engagement Rings do not cost the earth. Antique Jewelry and 20th Century Jewelry are eco-friendly alternatives. Antique Wedding Rings, along with Natural Pearls have a reverence for mother nature. Antique Jewelry is one physical gold investment you can Wear and Trust! This Jewelry Roars strength and quality and is an expression of your heritage. How To Choose A Wedding Ring ANTIQUE? 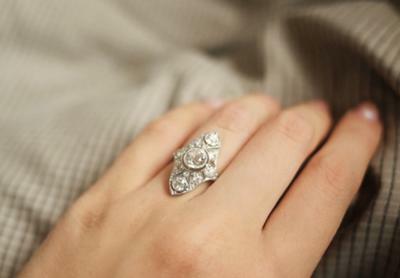 Some of the most unique antique engagement rings share a common feature - the color "White". This is because " Platinum" - which is a white metal, although discovered back in the 16th century, was not used in jewelry until the early 1900s and from that date, continued to grow in popularity. Around 1915, 18k white gold wedding bands were introduced as a perfect imitation of the more expensive platinum metal. Colored gemstone betrothal rings are suitable for women who prefer colored gemstones over colorless diamonds, like Mark Zuckerberg's wife, who wears a simple ruby engagement ring. Kate Middleton married on the 29th April 2011, to Prince William, Lady Diana's eldest son, wears the engagement ring today on her wedding ring finger. Vintage 20th century engagement rings are worn by celebrities, and grace the wedding ring finger of many modern-day starlets, including Madonna, Kate Hudson, Reese Witherspoon and Catherine Zeta-Jones, to name just a few. Whether your wedding is in Australia or India, unique antique wedding rings and also handmade wedding jewelry are within easy reach, thanks to the internet. Moissanite Diamond engagement rings are a less expensive alternative than genuine diamonds, for those people, who aren't hung-up on "diamonds are a girl's best friend" classic diamond ring. Faultily faultless, icily regular, Moi diamonds, have the same chemical properties as diamonds; the only difference is that Moi diamonds are created in a lab and are a whole lot cheaper. Some couples in love, prefer the old-world glamour of the Edwardian style wedding rings set with antique diamonds. This was the style the Passengers on the Titanic would have worn, when they boarded that fateful ship in the Edwardian era. Quality jewels like 18th Century, "paste" rock crystal, and marcasite. One of the most popular decorative styles to invest in is Jewelry from the Georgian era. Antique wedding and engagement rings are not hallmarked 'only-for-the-bride'. Have You Seen the Jewel of the Month?